We crowded into the living room of a Madison Heights home on Thursday, ready to dedicate prayer and support for her family’s amazing success. Her daughters proudly posed for cameras; her sons were off playing. On the table, a cake decorated in festive holiday colors, congratulating and wishing a home filled with love. Monday was Oak Park. Tuesday: Madison Heights. Wednesday was Pontiac. Today: Pontiac. When I got into journalism many moons ago, it was to tell stories and see my name in print. The novelty wore off as it always does and then it was really about the words. When I got into public relations six years ago, it was to earn a living. Journalism was changing and I had to figure out, amidst becoming a single mom of three very small children, how to put food on the table and keep a roof over our heads. I didn’t love PR at first. I thought I was selling out, stepping over to the dark side, from my beloved writer status. And the uncompassionate response I got from many fellow writers confirmed my suspicions. But something happened over the years. I fell in love with my work. I realized how lucky I am to do what I do and how grateful I am to have found this path. Part of it has to do with the amazing clients I have collected. Each one, whether non-profit or for-profit, is inspired to make the world better in their own wonderful way. That makes it easy to tell their stories and find relationships for them that will grow their reach. I’ve been working with Habitat Oakland for a year and a half now, and I can honestly say that every day I get to sit at a table with these folks is a really fun day. Every person on the team has a big heart and a bigger smile and I just love being around them – their energy seeps into my soul. Every homeowner I’ve met is an inspiring person as well, who has worked harder than I have ever had to. Their homes are beautiful. And the work that pours into making these houses homes comes from a lovely melding of people from all walks of life, and every corner of our local community. I get to call this work. Seriously, I count my blessings every single day. 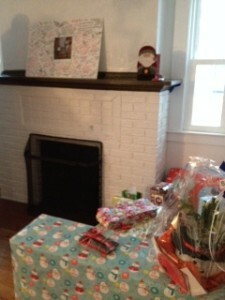 Last night, I had the good fortune to be included in the Habitat Oakland staff holiday party. It sounds funny, almost little girlish, but I was so excited to be included as part of the team. In a way, of course I am. But as an outside consultant, maybe not? When I get the staff emails about cookies in the kitchen, it’s an awfully long drive if I want to grab a shot of sugar. I had a blast. And as I left, I had the distinct feeling that this was very familiar. All my life I’ve been friends with people in every group but never in a particular group myself. I guess that’s who I am – friends with everyone, from my perch on the outskirts. I certainly am good at the juggle. But there is a little piece of something missing when you’re not in the bosom of the team. The role of the journalist, the writer, the public relations professional is to observe what other people are doing and help them tell their stories vividly, wonderfully, to the right audiences. We are, by definition, riding the outskirts and juggling topics expertly. On Tuesday, I am sitting for the APR exam, Accreditation in Public Relations. Funny, but I’m excited. This is my calling, my dharma, my path in life. And this path has led me to some of the most meaningful work in the world. Hats off to Habitat Oakland for an inspiring week – which I know is just part of what they do every day, driven by a mission to find affordable, safe housing for everyone. What’s your mission? And how does it drive you to make the world better? It’s a question for all of us, all the time because until we have that as the guiding light, nothing makes sense. Great blog. A good reminder that everyone should get involved in helping others. Good luck on your exam. Thanks for reading, Brenda. Haven’t taken an exam in decades so I need the luck!